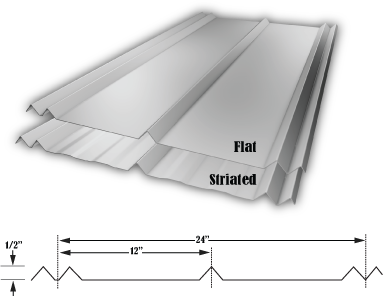 A TCM Metal Roof is custom made, shaped and cut for YOUR roof. A TCM Metal Roof will last 2 to 3 times longer than a shingle roof. 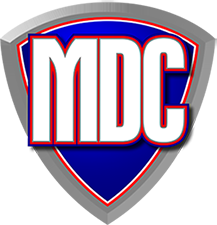 Our colored metal roof panels have up to 40-year warranties on finish, color chalk & fade and gloss integrity. We are an Energy Star Partner: Meaning our metal roof could SAVE you up to 23% on your energy bill. 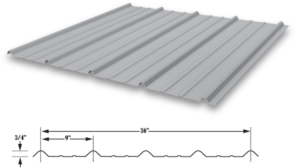 Our metal roof panels are Florida Product Approved tried and tested hurricane-resistant. A Tri County metal roof could be the last roof you will ever need! There are two main ingredients to paint and that is the pigments and the resin. Pigments provide the color, controls ultra-violet light transmission, and helps with corrosion protection. The resin is like the glue that holds the pigments together and provides the durability to the paint. Suitable for any roof with a pitch greater than 2/12. 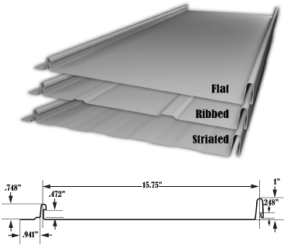 Tri County Metals Ultra-Rib Metal Roofing Profile is the most popular residential panel profile on the market. This panel is manufactured in our facility. 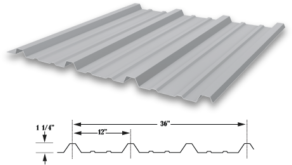 5V Crimp Metal Roofing panels have a classic look matching one of the oldest profiles on the market. Available in 26 Gauge only. Suitable for any roof with a pitch greater than .5/12. Tri County Metals PBR Metal Roofing Panels are the most popular commercial panel on the market. Available in 26 Gauge only. Suitable for any roof with a pitch greater than 1/4" /12. 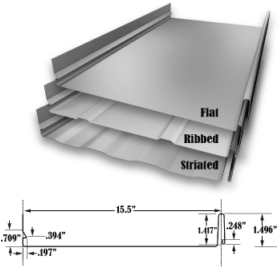 The most popular residential standing seam metal roofing panel on the market today. The panel screws are actually concealed underneath the panel and are not visible. That is what makes this panel unique. Available in 24 Gauge.